61 – M. Polly McKinstry, M.D. 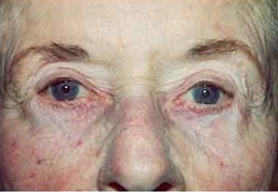 Lower Eyelid Malposition Ectropion – This elderly woman preoperatively had tearing and chronic irritation in the eyes secondary to senile ectropion with loose lower eyelids. These were corrected with a lateral canthoplasty where the eyelids were shortened and reattached at the outer corners.